DC's 52 got the wallet to open a little wider than it should've, but like The Spectre trying to hold Earth 1 and 2 together, it is now struggling under the strain. A few issues in, it's time to sit back and look at each title I picked up and see if it's worth going the distance with or it's time to end things before I get in too deep. The first batch went under the hammer yesterday, and now it's the turn of Legion Lost, The Savage Hawkman, Superman and Wonder Woman. 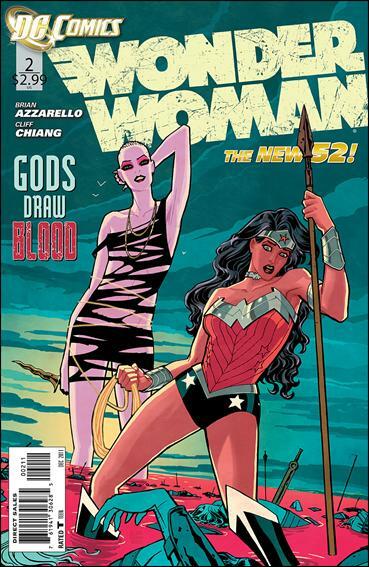 Right from the initial announcements, 100 Bullets writer Brian Azzarello on Wonder Woman was the team-up I craved the most. A few issues in, it's delivered my second favourite book on my current list. 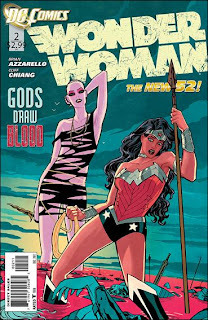 Perfectly matched by the artistic talents of Cliff Chiang, Brian thrusts Wonder Woman into the life of a mortal woman, impregnated by Zeus and thus earning the fury of Hera, his wife. With the Amazons trapped between the hunters and their prey, Diana stands as their greatest warrior, confident, straight-talking and with all the fighting skills a one-woman army needs. Hippolyta is blonde and back, the recap of Diana's origin takes all but six panels as a side-note in issue two, and the Gods of Myth are as incorporated and comfortable in the corporate world of suits and ties on earth as they are on the thrones of Olympus. While the power of flight doesn't yet seem to be in Diana's arsenal, when she, her views and her world are this well represented, it makes little difference. VERDICT: ***** Locked in. It isn't going anywhere. It's sweet to see DC getting behind the Legion in 20-11. 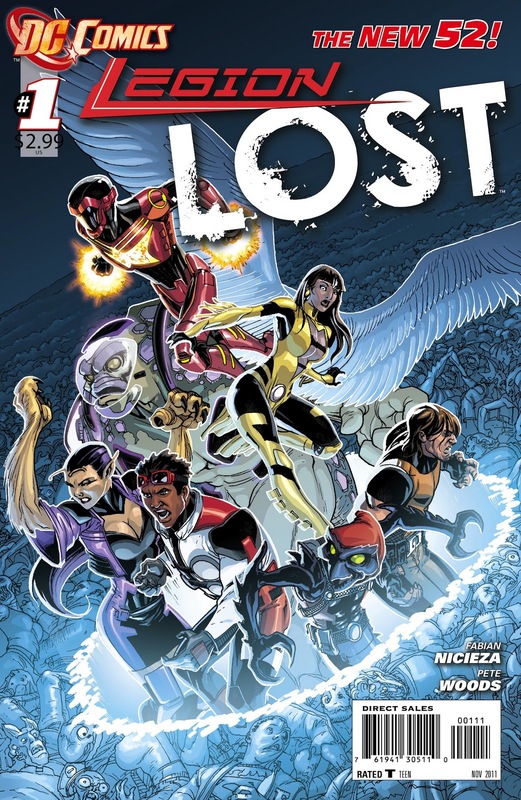 Here in this their second ongoing title, Legion Lost tells the tale of a group of Legionnaires trapped in their past, after failing to stop a deadly pathogen from being released into that time zone's atmosphere. Proven artistic workhorse Pete Woods has done an exceptional job setting a tone for the title and giving the crew a new look, that I'm sure already has the folks at DC Direct itchy with action figure anticipation. The limited cast size and modern setting will hopefully help new readers into a fantastic franchise, one whose character count often seems intimidating to outside readers. As an existing Legion fan though, I just felt these first few issues were a little ho-hum and lacking that 'Legion' feel. 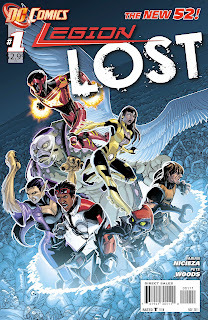 Writer Fabian Nicieza earned a lifetime pass with his various New Warriors books for Marvel, and I'm sure once he's up and running the culture shock happenings of this group of wayward teens could be well worth sticking around for. Verdict: ***** Wish I could squeeze it in, but computer says 'no'. Boy, I have an issue typing that title out. Hawkman is not savage. Originally IADW was going to be a character blog where my top six would each own a day and the 7th spot would go to whoever was nipping at their heels that week. Hawkman would've been Friday and when his next book showed the world how awesome he is, I would've had the 'I told you so' post ready. Even with the release of The Savage Hawkman, that post would still be saved in 'Drafts'. Phillip Tan is doing some of his best art here, but the book rarely reads like Carter Hall is in it's pages. 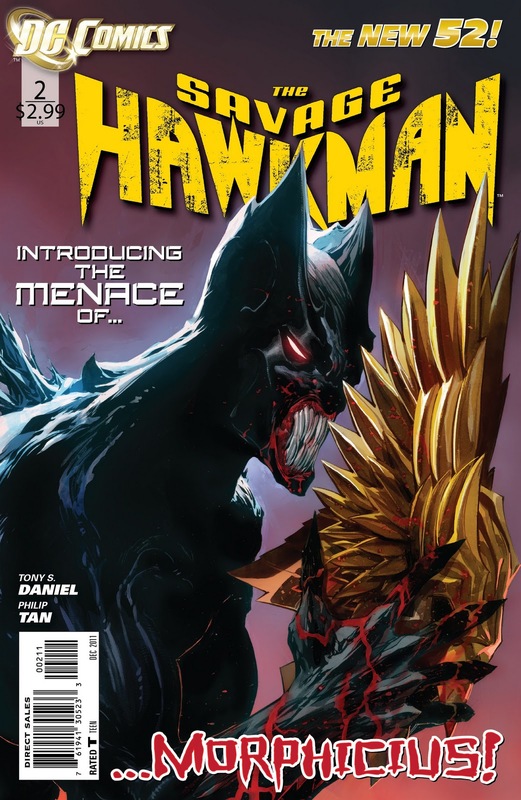 Odd, considering the character's got a more twisted history than a Rubix cube, making him a prime candidate for a 52 reboot, but instead we get this out of character/still the same character offering from either Tony Daniel or DC editorial, that apart from it's awesomely drawn wings, flies backwards down Hawkman's recent forward flight-path. On the plus side, it is good to see Carter out exploring the Earth's past again. The few scenes where he is doing his cryptologist work feel like some pretty strong feathers for the book to fly on, pitty they and the art are the only ones. What did I love most about this book? It's not a three second read. Writer George Perez revisits the 80's where comics gave you your moneys worth and got a story done in one issue. Even through I know the creative team is soon to change, I almost subscribed to the title on that fact alone. Jesus Merino does a sensational job of working to George's breakdowns. No one can put more panels on the page then Perez, yet Merino makes each and every one sing, without skimping on backgrounds. His style is a natural fit too, so hopefully he has more Superman in his future. 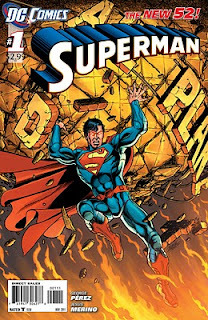 While the fact Lois is seeing someone else steals the press, George's idea to open the series dealing with Clark's reaction to the demolition of the Daily Planet and it's new premises as part of a tabloid media giant rather than an independent voice in a changing media landscape is brilliant to say the least. It provides fertile ground to pull out the similarities and backgrounds of Clark, the feisty Ms Lane, Jimmy and the never-say-die Perry, as well as relating to our own world. After the initial DC Crisis, George made Wonder Woman roar. Now after the DC 52 he and Jesus Marino are doing it all again with the Man of Steel - if only for a few months at least. Verdict: ***** Pulled - Just how comics used to be and better yet, with Superman! Dan, you, sir, must be my brother from another mother. I completely 10000% agree with your assessment of Hawkman. It needs to be brilliant, but it's just so. . .not brilliant. Wonder Woman is a must-buy for me, and Legion Lost actually survived on my list. 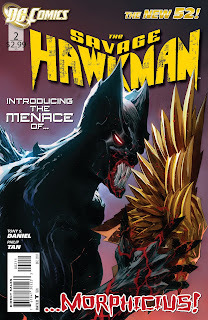 I read issue #1 of Savage Hawkman and immediately said "no more!" But Ilm glad to see Wonder Woman and Supes are staying in your pull list. I agree with your assessment of Superman and how it represents the Superman of old, and how Wonder Woman is nothing but pure awesomeness. Good choices Dan! Thanks for the great feedback guys! Glad you are liking the reviews. Seems DC fans share a pretty simillar thread if Hawkman (poor, poor Hawkman), Superman and Wonder Woman are anything to go by. Even Legion Lost to for that matter Doug, as that book actually made me re-re-re check the budget, but alas, there was no room in at the inn - and Timberwolf is my favourite Legionnaire! You'll have to keep me posted with how you think it goes, either here, or with your usual great reviews over on the ol' C.B of R.
Jimmy - I pretty much said the exact same words reading Hawkman. The Venom on my shoulder wanted a few expletives thrown in, but thankfully Peter Parker prevailed!